Outfit photos and link below! Also scroll to the bottom and check out my 6 Tips for Increasing Productivity!! Click the links below to shop the outfit!! 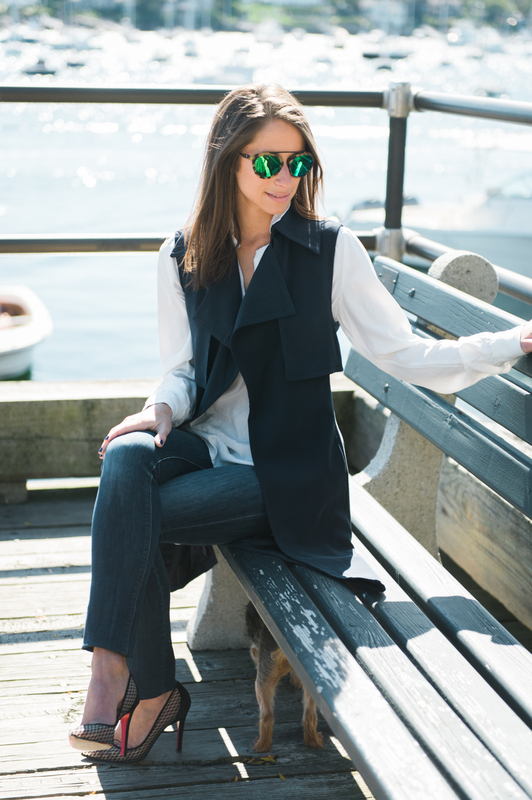 The vest is from Club Monaco and currently on sale, a must if you are in the market for a great trench vest!! As the Summer disappears into the past and Fall foreshadows our Wintery future, I look forward to a little more free time. With wedding planning in full force, a lot of that time will be reallocated to wedding prep, leaving minimal time for the blog and studying. Among all that is going on, I am working on getting my real estate license and taking the GREs with the hopes of heading off to graduate school in the next year or two. All of this means productivity and organization will be important to ensure I can get everything I need to done. WORKOUT: This is important for many reasons. Among the many health benefits, working out also releases stress, which is important, especially with so much to accomplish over the next year. It also falls under the category of wedding prep as I work towards tightening and toning before the big day. But most importantly, accomplishing that first task in the morning sets the tone for the rest of the day and energizes me for the work ahead. NO MORE SNOOZE: The snooze button only offers instant gratification. After that, it actually makes waking up even harder. Once you are awake, your sleep cycle is broken. Each cycle of sleep in 90 minutes, hitting the snooze button allows you to fall back asleep and enter into a new cycle that you will get 10 minutes into. Waking up in the beginning of the cycle as opposed to the end of a full cycle, could cause you to wake up even groggier than before. Take a look at ASAP Science’s Video on why the snooze button is bad. The moral of the story is, go to bed earlier or set your alarm for later, but don’t hit the snooze button! EMAIL ORGANIZATION: I’ve spent my entire working career organizing my emails by categories and sub-folders. This became of vicious cycle of getting behind, drowning in an inbox of various types of emails inclusive of “marked as un-read” and “flagged” for later. “Later” becomes never and productivity ends up at an all time low. But why is something that starts off so organized and productive so impossible to maintain!? Because it isn’t simple. It requires me to pause and contemplate where the email/task should go. It also requires that I remember where I put it, good luck!!! In addition, in most instances, a “pause” is a luxury I don’t always have available to me. That is why I have started organizing my email inbox into the three categories listed below. This new process allows me to easily get rid of unnecessary emails, access follow up items but also maintain and easily view important items in a simple, organized fashion. 30 MINUTE EMAILS: Dedicate at least two 30 minute sessions to answering emails. Block it off in your calendar so that no one can schedule a meeting during that time. Close your door and turn off your phone. You only have 30 minutes so its important that you stay focused. During that time, you can answer emails, organize and jot down tasks and check the “FOLLOW UP” folder. For me, “out of sight, out of mind” is serious issue. Allotting these two 30 minute sessions to email response and management allows me to catch up on pending items. PICK THREE: Pick three tasks to complete for your day and get them done. If you have a large project that will take weeks, dedicate today to accomplishing 5% of that project. Either way, ensure you pick three things and get them done. Three is feasible but it allows you to get at least three tasks completed as opposed to starting many but completing zero. SAY NO: I struggle with this all the time. However, in order to get everything done, you have to learn to say no to those people or things that get in the way of productivity. If someone invites you to a meeting or asks you to tackle another project, first assess your ability and availability. If you don’t have the time but you can’t say “no”, say “yes” but I won’t be able to get it for you until Monday. Setting those boundaries allows you to remain productive while accepting new tasks.